Go to the bottom right hand corner of your screen. Where you should see this. Click the more tab at the far right end and this should appear. Once you’ve done this click on the red/yellow flag. And a pop will appear. There are four sections to challange on the left hand side. Consider these as “levels” of difficulty and fame. You’re not able to do any other than minor until you’ve met their particular critera. To read it simply click on them and it will tell you. At the bottom the first thing to note is there are four tabs. 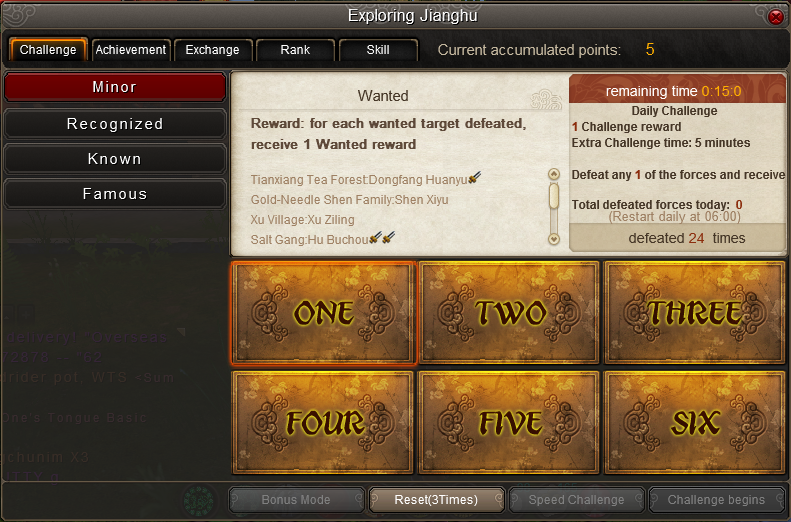 Reset: You get x6 per week, it resets Monday morning. 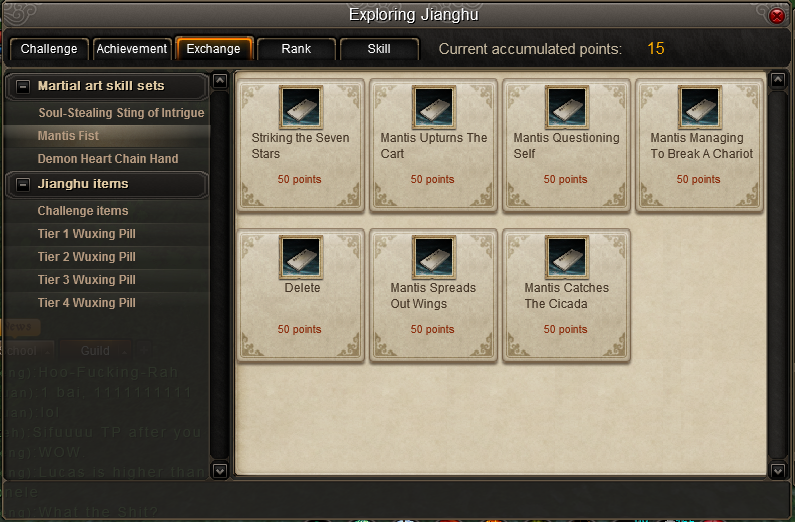 So in total you could potentially run Janghu Explorer 36 times per week. Challenge Begins: Self explanatory. 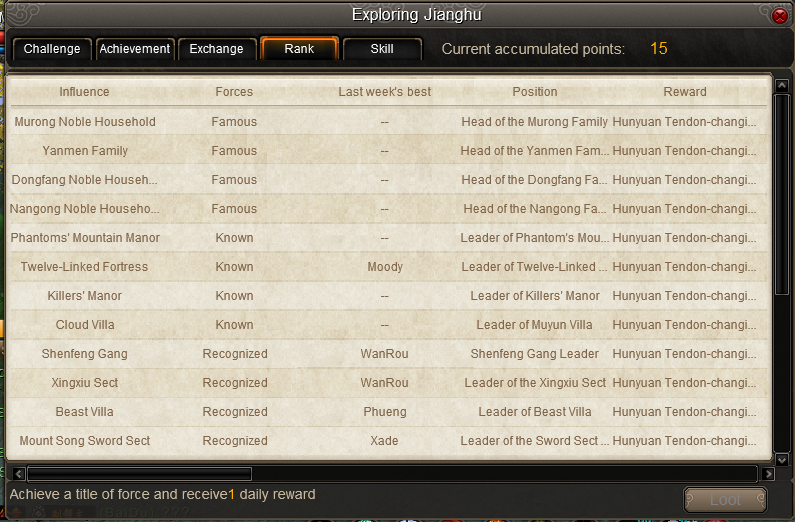 You start the jianghu missions. First click on “One” button. A mission like this will appear. 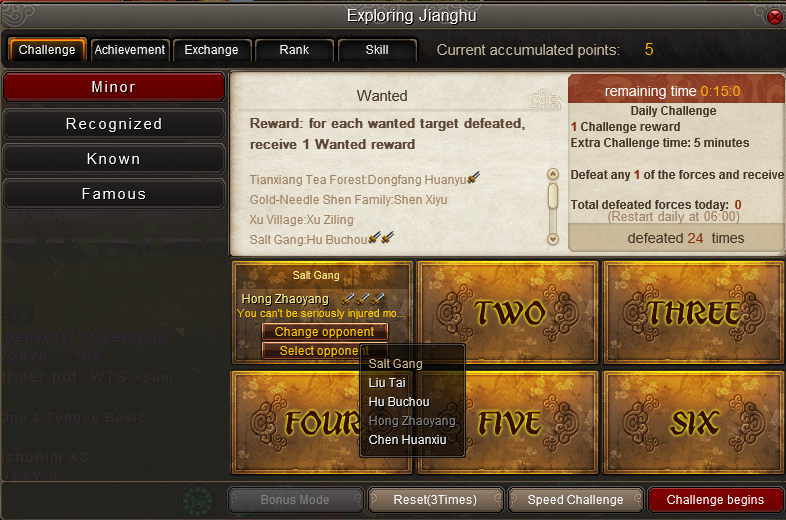 Now these are all random so the mission could range from like don’t die to you have 3 min to kill the boss, go. 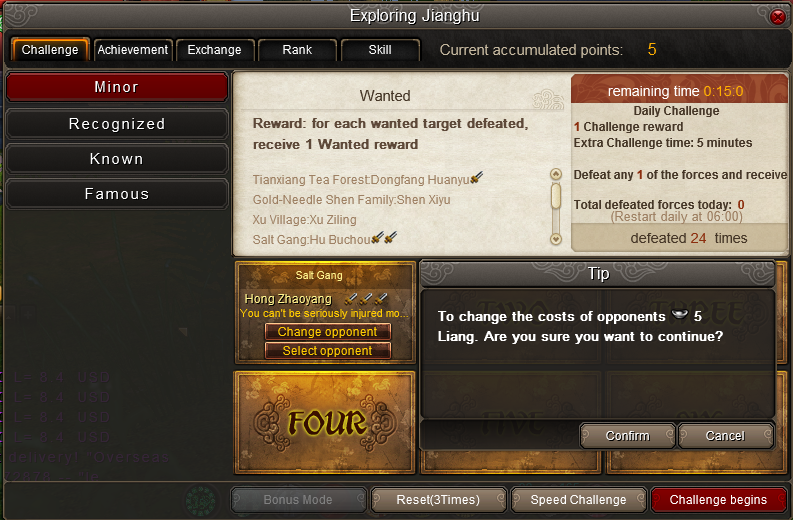 You are given 1 free (change opponent), after which you can pay a certain amount of taels (tradeble money). Now you will notice two main differences, one their is now a timer at the top right corner. Secondly there is a new skill bar. The timer is there of course to time you. It will record your best time regardless of how many attempts you make. This will be more explained in the next few section. Pretty self explanatory again. Click on any of the left hand tabs and scroll down. Each one has a particular goal or objective that one is able to achieve in the instances. 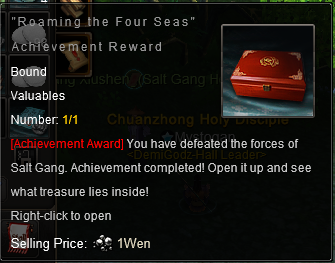 Once completing a particular mission, the achievement goals completed. One will see a big stamp saying FINISH which one can see in the above image. 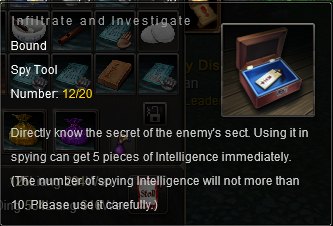 Simply click the loot button and you will receive in the mail. You will receive a box like this in the mail. Which could contain any of the 3 below. 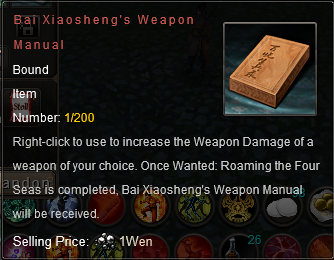 Now an important thing to note about the Bai Xiaosheng’s Weapon Manual is that when you right click it a pop up like this will appear. 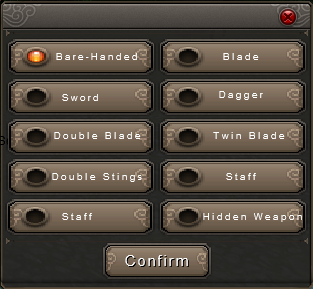 Select a weapon you wish to add more dmg to (as you can see i choose the fist). Now if you press C, and go to the far right bottom tab you will be able to see the points that you’ve added to your particular weapon. 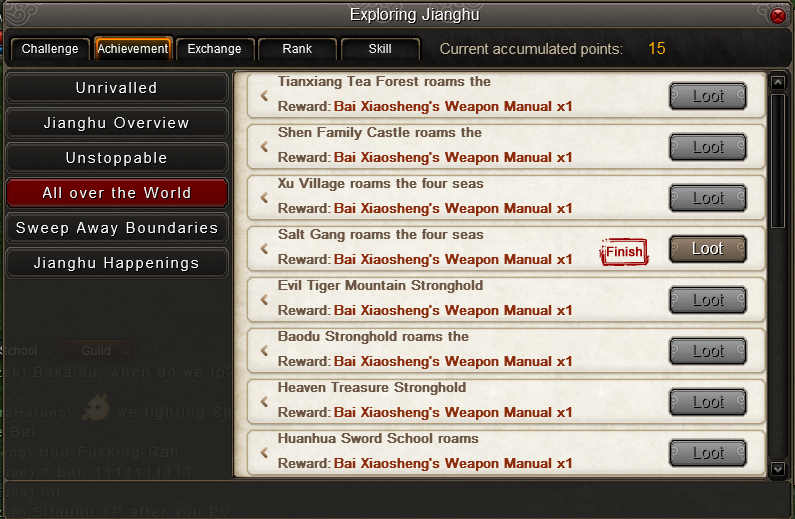 The higher you go the more “Bai Xiaosheng’s Weapon Manual” you will need to inorder to achieve the next level of damage. If you you’ve been paying attention you will notice that at the top right hand corner there is a “Current Accumulated Points: ?” tracker. 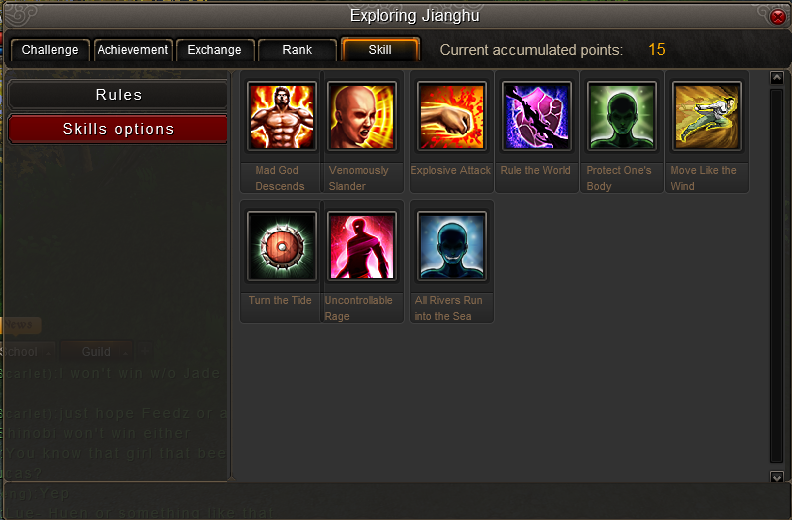 This is important for all those who wish to spend some of their hard earn points on Martial Art Skill sets or Jianghu items. Spend the points wisely. 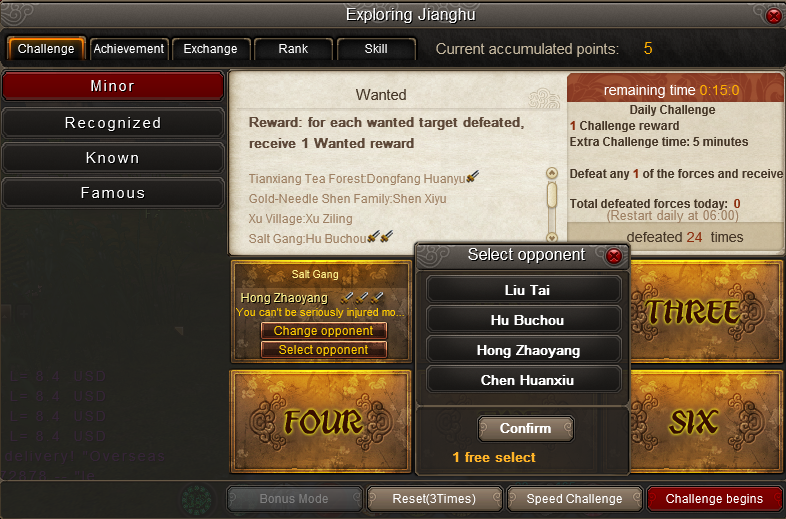 The points come from the challenge section, each mission you complete you receive a certain amount of points. So hypothetically one could attain 360 points per week. 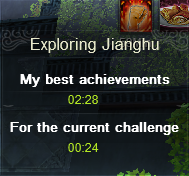 This is where that timer comes into play not only are you racing against yourself but against fellow players on the server. They are doing everything they can just like you to beat their times and get to loot at the bottom of the tab. Rules: You can read yourself. Is in my opinion the more important tab. 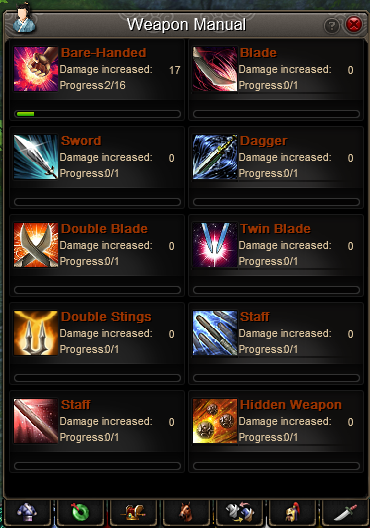 Here you have 9 different buffs/skills that can help you during your mission. 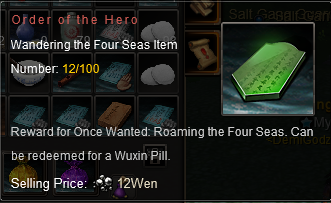 The catch is each one costs you 1 Liang (trade able silver). Explosive Attack: Does damage to all all surrounding (10 meters radius). Damage is equivalent to their max HP (basically hit a boss with this and a bunch of minions around and all of those pests are down). Rule the World: 15 Meter Radius stun. All are “vulnerable”, and clears their super armor affect. “Vulnerable”An additional 100% damage is received when taking damage”. Protect One’s Body: Max HP raised by 30% for (2 min.) Also absorb dmg. Turn the Tide: Lower dmg by 90% for (15 secs.) When finished causes dmg equivalent to your max HP. Also has probability to do cause 10% HP damage to surrounding enemies. Uncontrollable Rage: Get 50 Rage points and get 10 more rages points every second for the next 10 seconds.